Tooth extraction is the removal of a tooth from its socket in the bone. A dentist’s first preference is to save the tooth that has been broken or damaged by decay, either by placing a filling, crown or other type of restoration: however, there are times when the damage is beyond repair. In some cases, a tooth may no longer be able to be restored or repaired, and it may need to be removed. 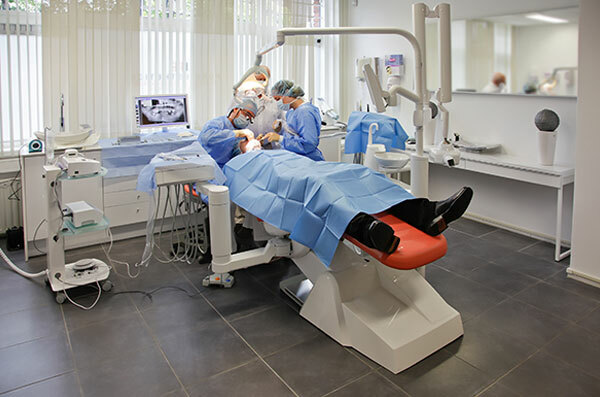 While some cases prove to be more complex and need to be seen by a specialist in oral surgery, many others can be performed by a general dentist with the appropriate expertise to do so. At Albion Dental Office, Dr. Trotti is able to remove teeth that have been compromised by infection or trauma while keeping a patient as comfortable as possible. An X-ray image of the area will be taken to help plan the best way to remove the tooth. While the procedure is being performed, you can expect to feel pressure (most frequently described as a “pushing” on the tooth), but should feel little to no discomfort. In some cases, where the extraction is simple, the tooth is loosened with special instruments before removing it with forceps. Simple extractions are usually cases where a significant amount of the bone holding the tooth is weakened, or has dissolved. In these cases, the tooth may already feel loose, and will prove easy to remove. A surgical extraction is a more complex procedure: it involves cutting the root of the tooth into separate sections, or removing some of the bone holding a damaged tooth that requires removal. It may be used if a tooth has broken off at the gum line, or if it has not yet emerged into the mouth. Surgical extractions commonly are done by oral surgeons; however, they are also done by general dentists with the appropriate expertise to do so. Sometimes it’s necessary to remove some of the bone around the tooth or to cut the tooth in half in order to extract it. For any extraction procedure, patients receive local anesthetic. In order to remove a tooth safely, it is extremely important that any patient be made as comfortable as possible: in some cases antibiotics may be needed after, or even before a procedure is done. Upon completion, Dr. Trotti and his staff will provide you with detailed instructions on what to do and expect after surgery. After a tooth has been extracted, if not replaced with a dental implant, the bone will start to break down in the area where the tooth was removed after 6 months. Bone loss after an extraction can result in an alteration of one’s smile and facial appearance. You can look at what we have to say about dental implants here on the website, and come to our office to discuss if dental implants could be an option for you.